The advent of drones is building momentum in the wider industrial sector. But what can the technology bring to the engineering and infrastructure industries? Satellites, aircraft, space shuttles and other man-made technological marvels have long been used to provide a tactical and advantageous birds-eye view of the ground below, the information of which has been used to even provide us with our first glimpse of Earth in its entirety. Now, unmanned aerial systems (UAS) – or drones – are taking to the skies and providing their own unique advantages to a range of sectors. 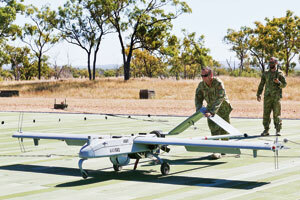 Lieutenant Colonel Keirin Joyce leads the Australian Army’s program for UAS, where one of the technology’s main applications is in the Army’s tactical and mapping team. However, the technology is also playing a key role in an engineering context. “From an Army perspective, UAS are a game changer and we’re using drones any way where it makes things more effective and safer,” he says. The Army uses three types of UAS of varying sizes and capabilities for different purposes. 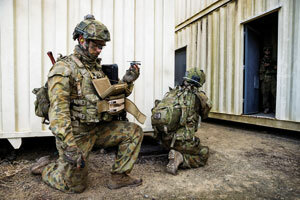 This is from the Black Hornet Nano UAS, which fits in the palm of a solider’s hand, to the Shadow 200 Tactical UAS, which stays up for nine hours and flies up to 100 kilometres away. Lt. Col. Joyce explains that the Army’s majority use is in combat operations to analyse situational awareness and remove soldiers from potential dangers. “At a smaller level, it’s about not having to send soldiers over an incline, over a hill or creek line and we can send them over safely,” he says. The same goes for the Army’s combat engineers. “Our first real concept for adopting the technology was geospatial intelligence and the ability to track movements and explore cities. If there are suspected IED (improvised explosive device) sites, for instance, we can go in first for a look with a drone. The Army is also using drones to enhance its mapping capacity and in traditional engineering roles. “We have a couple of them working on geotechnical solutions. We can fly them in an overlapping pattern and create very detailed and up-to-date maps based off the topography of the area,” Lt. Col. Joyce explains. The Army is also conducting engineering surveys with the drones in military situations, such as inspecting bridges to ensure they can handle the weight of a heavy military convoy. While the Australian Army has experienced the benefits of using drones, also know as remotely piloted aircraft systems (RPAS), for engineering applications within a military context, Lt. Col. Joyce says their use of drones is entirely translatable to infrastructure engineering works. “You can fit high-quality lidar to a drone and that can provide a lot of benefits to a project throughout construction. This includes access to tolerances, measurements for fit-out – all of these different things normally done manually on the ground,” he says. © Commonwealth of Australia, Department of Defence. Like the Australian Army’s use of drones for bridge inspections and other civil surveying activities, Australia’s road authorities are reaping the benefits the technology brings. Main Roads Western Australia (MRWA) has taken quickly to the RPAS technology adopting it for use in structural inspections. Most recently, the organisation has been using drones for bridge inspections on Perth’s metropolitan network, namely on the Mitchell Freeway’s Hector Street footbridge. Peter Sewell, MRWA Director of Metropolitan Operations, says all bridges on the Mitchell and Kwinana Freeways have rail in the medians and, as a result, are very difficult to inspect unless there is a scheduled rail closure for maintenance work, often at night. Prior to beginning drone inspections on the Perth metropolitan network, MRWA worked with its portfolio partner, the Public Transport Authority, and the drone operator provider for more than three months before approval to fly was given. Mr. Sewell says the benefits in efficiency, cost and time-savings have been significant. “By using drones we’re doing inspections that would sometimes take four hours in just 30 minutes,” he says, adding that it frees up MRWA resources, improves safety and also saves on using traffic management services to close a road. Besides structural inspections, MRWA has been using drones in a variety of ways. These include survey data collection and measurement, project monitoring and stakeholder engagement, inspection of flooded bridge sites and floodways after cyclones, area mapping and project pre-condition, time lapse and final project outcomes. Mr. Sewell adds that using the RPASs for time-lapse videos and as a means of illustrating the progress of a project has been a real benefit for its stakeholder engagement activities. “MRWA is also sponsoring the Western Australian Police to buy three drones and train reconstruction officers in the operation of the devices, which will be used to take 3D images of major crash incidents on the road network,” Mr. Sewell explains, adding that the use of this technology will greatly reduce the time freeways and highways are closed. In addition to its metropolitan operations, drones are also playing an important role in the road agency’s regional and more remote projects. Drones have been used in the Pilbara region in the past 12 months for bridge inspections, reducing the need for staff to climb down and under bridges. “It eliminates the need to mobilise and use over bridge inspection platforms or elevating work platforms – including the associated traffic management services, which is also a safety risk,” Mr. Sewell says. “It also mitigates the need to work over water from boats or other floating platforms and generally requires less staff to be involved in the inspection, which saves on operating costs. Mr. Sewell says drones are increasingly being used around flooding events, particularly for local governments applying for Natural Disaster Recovery Funding. “Local governments have to provide evidence of roads pre and post disaster and they are starting to use drones to gather that information,” he says. The technology is also being used for site and pit inspections work to check clearing extents, provide a better understanding of the local hydrology and drainage and identify changes in geological strata that may impact material changes in pits. “They are now being used to keep site progress records as works are being executed, which will help in the assessment of contractual claims,” Mr. Sewell adds. Likewise, MRWA is using drones to undertake material survey work in the Pilbara region. “This has been accomplished by utilising web-based software to analyse the drones’ high-definition photos of material stockpiles or earthworks to quantify the volumes of material being used or placed within the works or within a stockpile,” Mr. Sewell explains. He says it is also of note that the first under-bridge drone inspection MRWA undertook in its regional operations – bearing failures on the Yule River – resulted in cost-savings in plant, traffic management and staff time that exceeded the cost of the drone. Mr. Sewell explains that drones will be part of the organisation’s long-term strategy in both the Perth metropolitan area and the regions given the cost reductions and efficiency gains they offer. 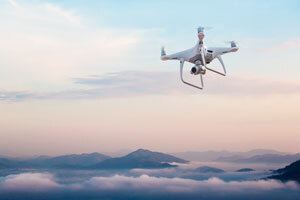 “However, the viability of drones will be significantly improved provided they can be interfaced with web-based systems (such as our video survey assessment tool MMIS Application Solution) to enhance their utilisation,” he says. The MMIS system, for instance, uses a straight line kilometre system which records video in real time on the road, providing key network information back to the organisation. Mr. Sewell says the next step would be to integrate the system with the drones for similar purposes, but from the air. “It’s adapting the technology we already have to drones and that’s something we’re developing going forward,” he adds. To advance the uptake of the technology, MRWA has drafted a guideline – Remotely Piloted Aircraft Systems – for use within the organisations and has three trained Civil Aviation Safety Authority (CASA)-certified operators who provide advice to its Asset Management Branch and regional managers on the operation of the drones. “In the metropolitan area, MRWA will continue to work with our portfolio partners in identifying opportunities to use drones where appropriate, particularly where their use minimises the disruption to the travelling public and it is safe to do so,” Mr. Sewell says. Lt. Col. Joyce says drone technology can also help transcend conventional engineering ideals, and there is a wide range of yet-to-be discovered applications for the technology in this context. He exemplifies an acquaintance of his who is employed for a range of RPAS-specific roles, including for construction companies. “Companies building apartments use his drone services to take a picture of where each different window position of the apartment building will be once built. That’s then used for promotional purposes,” he says. “The same guy has been used by construction companies in the ACT to provide a record of assets on a site each day using a drone,” he says, adding that this helped businesses keep a record of when, for instance, a scaffolding subcontractor was onsite and had finished their work. The advent of drone technology ultimately presents the engineering sector with the opportunity, but also challenge, to adapt and adopt the technology. “There are a lot of engineers out there that might be cautious about the impact drones may have on their roles,” Lt. Col. Joyce explains, adding that, ultimately, new skillsets are required to implement RPAS technology into the field. Lt. Col. Joyce says drones have a positive role to play in Australia’s engineering future, and the market is well prepared to take the next step. While not necessarily a cheap exercise, Lt. Col. Joyce says using drone technology is well supported in Australia, particularly through both CASA and industry body the Australian Association for Unmanned Systems (AAUS). “Australia’s drone industry has been blessed with an industry body – AAUS – that was set up really quickly. They established themselves nearly 10 years ago, run annual events and provide details on the advances in technical capability and developments coming from CASA,” he says. “I think there’s potential for future growth as people become more familiar with the fact it’s essentially a flying camera. Drone technology has definitely ramped up in recent years, but it’s manageable. We’re at the stage where we need to keep pace with the technology and keep an eye on what’s the next development out there.